Aditya, Diya, Jayesh, Vishaka, Sairaj and the other children with whom I connect weekly via Skype in Granny Cloud sessions, are generating questions, the answer to which is ‘home’. I’ve written before about this Grade 6 class and their school and about the special opportunity I had to meet them in person. This session is a follow-up from last week’s introduction to children’s rights, for which I have googled a Marathi translation, before checking the accuracy with them – मुलांचे हक्क. Are homes the same everywhere in the world? We look at images of homes, an igloo, a mud hut, a house on the water, a tree house and an underground house (Coober Pedy, Australia) and the children wonder who built these houses, where they are, who lives in them, what materials were used, how they are accessed. Aditya wonders if there is oxygen in the underground house. Atharva asks what would happen if the tree (in which the house is bulit) fell down. Gaurauv asks if I live in an underground house (it’s in Australia, after all) and I take my laptop to the window to show them the garden. As always, I delight in the fact that the children who once stared blankly back at me from the screen, a strange looking woman talking a foreign language they did not understand, now chat confidently, ask questions, make jokes, think and laugh with me. The other group with whom I currently engage is at a government girls high school in urban Delhi, relatively close to the original office from which Sugata Mitra began his Hole in the Wall experiments, a school that has been involved in his experiments ever since. Anshika, Priya, Shivani and the others choose the song ‘I have a Dream’ to sing for me and I ask what dreams they have. ‘I want to be a politician so that I can reduce poverty’, one girl says confidently. One girl dreams of being a doctor, another wants to be a soldier to protect her people and a third hopes to teach the poor who don’t have access to education. Nazreen dreams of being a singer but her parents have forbidden it for religious reasons. Nikita dreams of being a famous singer too… so that she can make money and buy her parents a house and help other less fortunate people. In the middle of one such session recently, I receive an unexpected call from a Skype number that’s been in my contacts for years. I’m incredulous to see Gouri, whom I have not seen for six years, since she engaged in Granny Cloud sessions as a lively teenager, in the rural village of Shirgaon, in Maharashtra. Gouri has been selected by the BBC as one of 2016’s 100 inspiring women and camera men lurk discreetly in the background for a news piece as she and I re-engage after all this time. We talk about what we’re doing now and what we remember from the old days, in particular a series of interactions in which she and her classmates talked and sang with a group of Grade 6 students at my school in Australia. (I still recall their wonderful reflections from 2010!) This lovely, poised young woman is an impressive ambassador for the Granny Cloud project. A row of serious children sat in front of the screen and stared at me. This was my first interaction with 5th graders at KNB in Phaltan, India but, with several years of Granny Cloud experience, I knew the discomfort wouldn’t last long. Despite the standard response to most of my questions being blank stares, I persisted and, within a few sessions, we were all more relaxed and the children’s confidence and English began to improve. In one session we talked about sports, they told me about Kabaddi and Googled Aussie rules. In another session we looked at art. I introduced them to Picasso, they did their own searching and then produced surreal pictures of themselves. They told me about their school, their lessons, their families and their celebrations. I shared pictures of my grandchildren and, on one occasion, I showed them the classrooms at my school and they had great fun reading children’s bios on their lockers and noticing commonalities. Once we did a combined session with another group at a school in Delhi. In the middle of what I’d thought would be an interesting opportunity they sent me a text to say they would rather talk to Edna Granny. Gradually individuals began to emerge as leaders. I observed Aditya’s particular curiosity and eagerness to learn. I noticed the thoughtfulness in Sanika’s eyes when ever a question was posed. I was delighted by Diya’s confidence in disrupting my plan for a session and replacing it with her own. And then, miraculously, I had an opportunity to meet ‘my kids’. A few days in Pune for an IB workshop were extended to include time with my friend Suneeta and a couple of very special visits to KNB, once to work with the teachers and, finally, to meet Saniya, Aditya, Diya, Sairaj, Jayesh, Aishwarya and the others… in person. They waited eagerly near the gate, then hung back a little shyly at first but a couple of warm up activities melted the ice and soon everyone wanted to talk and there was much laughter. 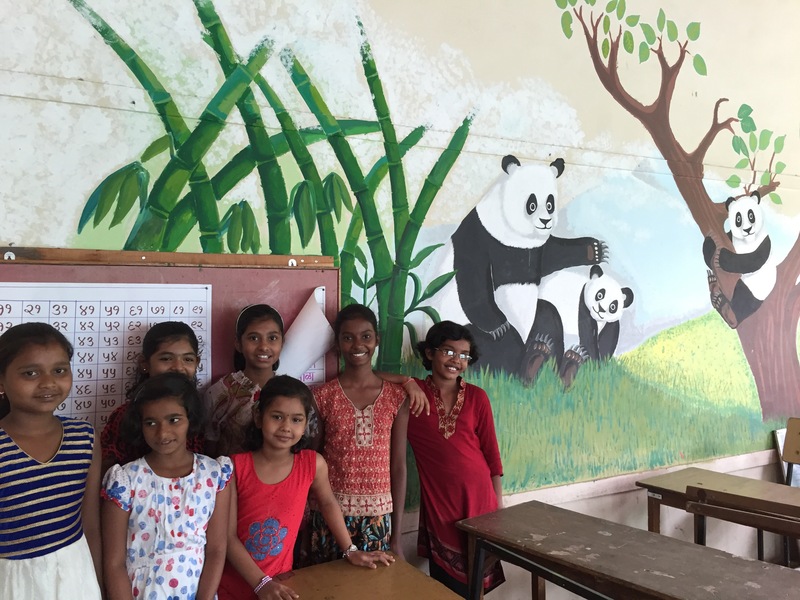 They took me on a tour of their little school, showing me each classroom with its stone floor, old style desks, glassless windows and surprising, colourful images adorning the walls, painted by the children and their parents, of honey bees, pandas, flowers and flamingoes. They took me to the library and we sat in a circle on the floor reading the picture book I had brought them. They sang and danced, we played and talked and they presented me with carefully made cards. Teachers may no longer be needed. Could it be that you don’t need to go to school at all? If you’ve watched Sugata Mitra’s TED talks, you’ll have heard him deliver these and other similarly provocative statements that challenge the notion of school as most people know it. Wherever his work is mentioned, responses range from highly positive to even more highly critical to quite rude. For every teacher excited by his ideas, there are several who find them insubstantial, objectionable or downright threatening. For me, this is part of the charm! “It’s not about making learning happen, it’s about letting it happen”… THIS is the key. Are you ready to acknowledge that children are able to learn by themselves? Have you taken steps to release control and encourage your students to take ownership of their learning? Are you ‘letting learning happen’? I’ve followed Sugata’s work since the early days and his ‘hole-in-the-wall’ experiments influenced the thinking of thousands of teachers, by highlighting the possibilities of student driven learning. In the video below, he talks about the current status of the School in the Cloud project, his wish that won the 2013 million dollar TED prize. “What would it be like if we had the kind of world where if you asked a child ‘Do you go to school?’ he says ‘I don’t know’?…well, think about that”. When I once showed my elderly mother photos of learning in the school at which I work, it didn’t look at all like school to her. I sincerely hope that when my great-grandchildren go to school (if indeed school still exists), it won’t look anything like school today. For now, I’m excited to be working with teachers and learners in these changing times, exploring inquiry learning, provoking thinking, pushing boundaries, challenging the notion of school as it used to be and ‘letting learning happen‘. And I’m even more excited to be part of the learning in Sugata’s ‘School in the Cloud’. 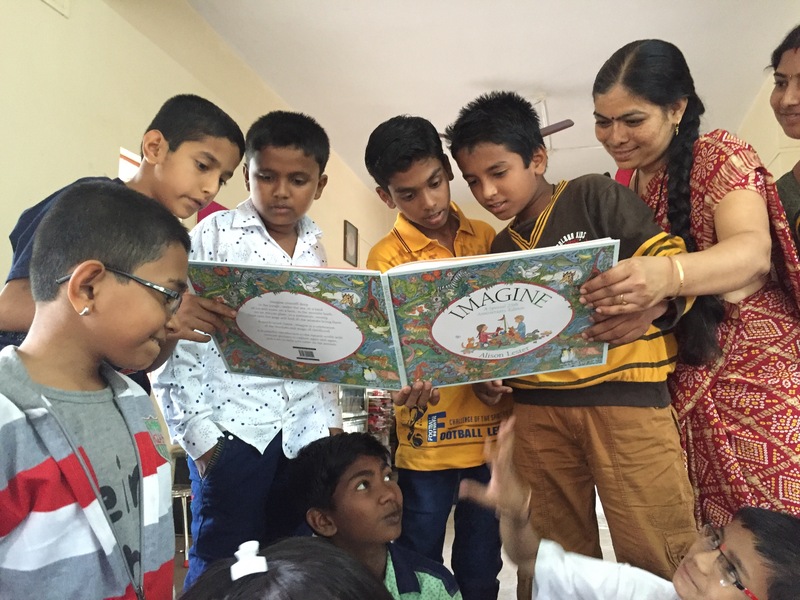 I’ve been a member of the ‘granny cloud’ for a number of years, interacting with children in a range of settings in India and, along with the other ‘grannies’ (including people of both genders and all ages!) supporting Suneeta (Research Director of the School in the Cloud) who’s been instrumental in keeping this project alive, breathing life into it during even the most challenging times. Yesterday marked the opening of the first ‘School in the Cloud’ in India, at a government girls’ school in Delhi, a stone’s throw from the site of the first hole-in-the-wall, and I was there (well, only on the screen), not just observing, but playing an active role. As always in these sessions, the children started off a little reticent, quiet, filled with awe… but soon they were chatting and smiling and even singing for me. 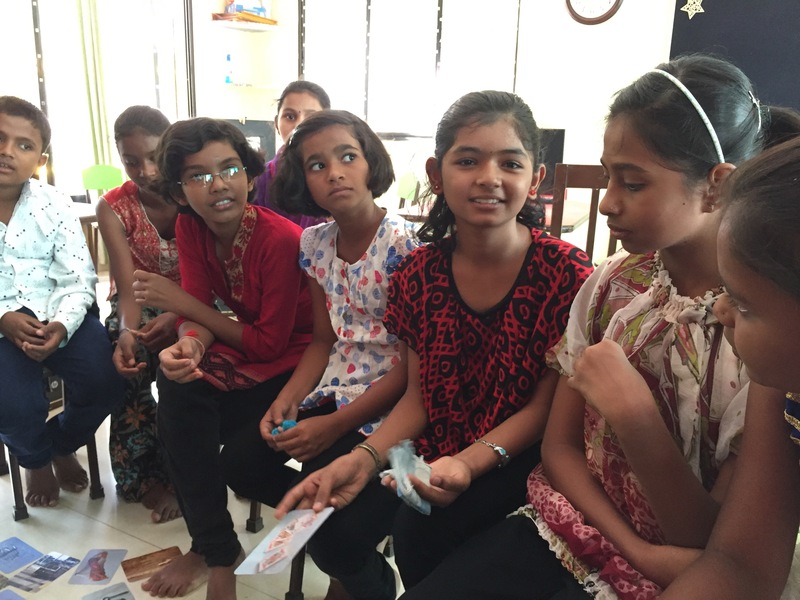 It didn’t matter that there were other people in the room – Suneeta, the media, visitors, Sugata and his crew – I was unaware of them as I engaged with the kids. It didn’t matter that screen-sharing wasn’t working properly. The cloud grannies are used to abandoning plans and improvising. It didn’t matter that the girls are unfamiliar with Skype and didn’t know where to type their names, when I didn’t quite understand their accents. They will figure it out next time. Manjunath loves cricket. Sukanya is a baseball fan. Lingappa likes to play volleyball. My young Indian friends say their names and their favourite sports, with accompanying actions. To play this game they each need to repeat all the previous names and actions, so by the end the ice has broken, they are relaxed and laughing and I am finally becoming familiar with their names. This is my forth Skype interaction with my group of Grade 8 students in a SOME session at Ashraya Neelbagh (a residential school for children of migrant labourers 100Km from Bangalore) and things have certainly warmed up since the first. Marlinga’s favourite sport is Kabbadi, which I haven’t heard of, so I share my screen and show them how I can type the word into Google to search for and then watch a Kabbadi video which comes up. Then it’s their turn to find out about Australian Rules Football. I leave them to it for a while and they take turns to read from a site they find, then share their discoveries with me. I show them a video of Aussie Rules and they are clearly entertained! We talk about time differences and adjusting the clock for daylight saving, as I accidentally came an hour early, forgetting about our clock change! I give them the link to Qlock where they can compare my time with theirs and check the time in other places in the world. This leads us to Google maps. I share my screen and try to place them on the map of India. They are quick to inform me that my positioning is incorrect! So I show them how to share their screen with me and ask them to find themselves on the map and show me. It’s great to observe the process as they explore and figure out what to type in the search box, how to zoom in and out and shift the map around. Why are they sitting in lines? Why do they keep glancing to the back? Why are they less responsive than last time? Why are they much quieter and more serious? There is a teacher present. I’m interacting via Skype with Grade 8 students in a SOME session at Ashraya Neelbagh, a residential school for children of migrant labourers near Bangalore and, to my surprise, I’m not finding it all that easy! When I first began to interact with Indian kids in this way, it took a while to overcome the obstacles, to understand their context and to adjust my expectations. You can read about my early sessions with SOLEs and SOMEs here and here. Once past that initial stage , my experience of such sessions with SOLES in the past couple of years has usually involved a bunch of enthusiastic, noisy children gathered around the computer, often all talking at once. 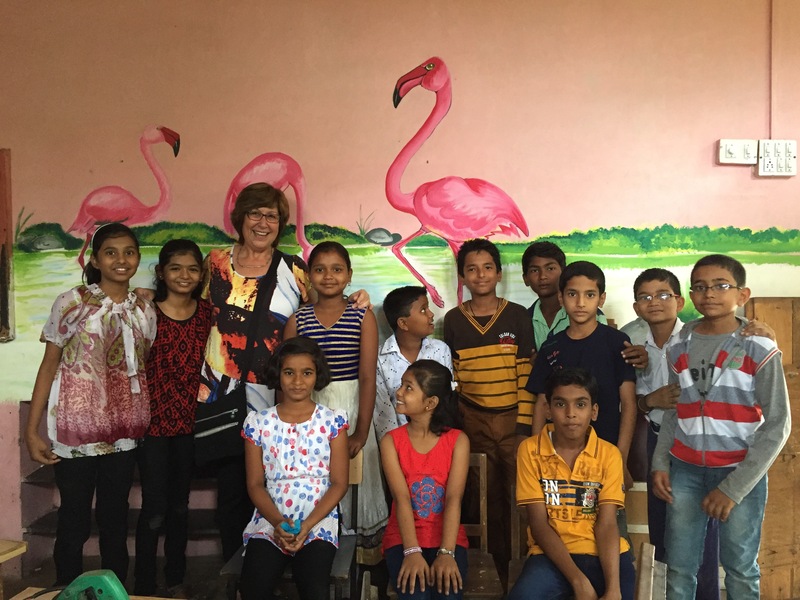 In one case, it led to a series of valuable learning interactions between some of my own students in Australia and a group at a rural school in Shiragon, 100kms from Goa. Despite the differences in language, environment, culture, economic background, and religion, they found much in common. This is the first time I have worked with a group in an organized setting such as Ashraya, and it feels more like a school class… albeit a very different type of class than the ones I am used to in my own setting. The children sit in rows on the floor, listen attentively and respond when spoken to with a ‘Yes Ma’am’ or ‘No Ma’am’. They look towards Rajkumar, the volunteer facilitator on their end, every now and again for clarification or reassurance or both. In my first two sessions, I call them to the camera one by one and ask them individual questions about their families, their favorite subjects at school and the festivals they recently celebrated. They respond willingly and I make a few notes beside their names on my list to help me personalise our connections. I notice 14-year-old Marlinga, right away. He tells me he loves Maths because it’s like a game. It’s different from the other answers, which are polite, short and to the point. He’s the only one who really responds when I ask why a particular subject is their favourite. Is it because his English is better than theirs? Or is he is just a little more confident than the others in interacting with this strange, foreign woman? When I ask if they have any questions for me, they say ‘No ma’am .’ I share pictures of Australian animals which they appear to enjoy. I show them where I am on the map compared to where they are and they answer my questions about their area. I show them photos of kids at my own school. They seem interested, but have no questions. I am a bit at a loss as to where to head next. I wonder what interests them and how to move past their polite responsiveness. Guest post by Jackie Barrow who has been involved in the SOLE and SOME project for over three years. During that time she has interacted with different groups of children in a variety of locations in India. 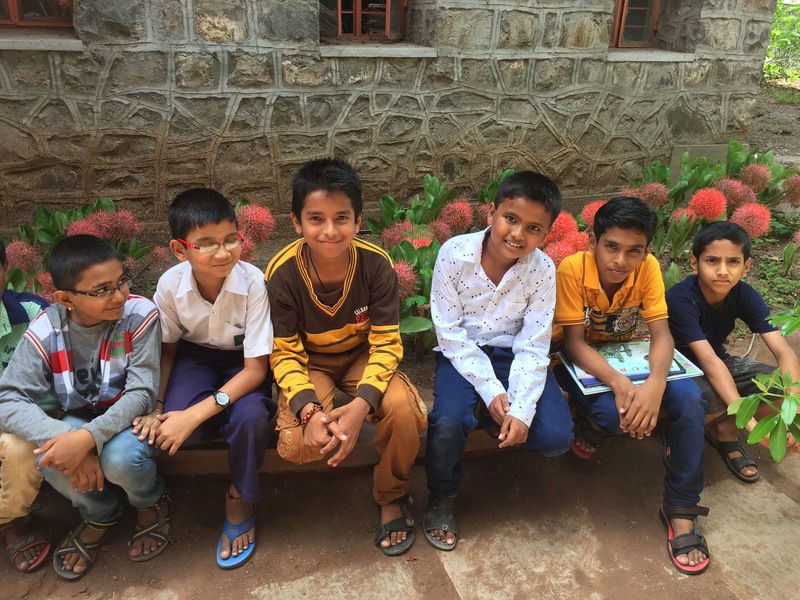 My relationship with Khelghar Palakneeti, a charity run after school provision for the children of the Lakshminagar slum of Pune, began well over a year ago. Their unwavering commitment to the SOLE project is what makes it work so well. For one hour a week, the children are permitted to use the office computer in order to connect with me. No, of course it doesn’t always run smoothly! There are all the usual frustrations; poor connections, no sound, no video, no children, no staff, monsoon rains, holidays and festivals at both ends meaning we’re not around. But when sessions don’t or can’t take place for any reason, we let each other know. This continuity has allowed me to build a real relationship with the children and staff. Back in April a film crew from the BBC’s Technology Website came to film me Skyping my group at Khelghar and talking about my involvement in the SOLE and SOME project. Following on from this, the BBC’s One Show, a magazine style programme, proposed a trip to Pune to meet and film with my group of children. I am sure you can imagine how thrilled I was. This was an opportunity not to be missed. I had no reservations about the trip itself but I did have reservations about the filming. I was worried that the cameras would be intrusive and alter the nature of my interaction with the children. We were to visit the slum where the children live and meet with their families. I thought maybe this would seem somewhat voyeuristic and that the slum dwellers might resent our presence. However, I need not have worried. The two young men who made up the film crew had both visited India before and were as excited as I was about the project. They quickly became favourites with both the staff and the children and although they and the cameras were ever present, none of us felt inhibited by their presence. Well, that’s not entirely true. I did! Not when I was reading stories, teaching felting or just chatting with the children, but I found the ‘interviews’ more difficult and the constant need to try to articulate how I was feeling. How was I feeling? Well, just completely overwhelmed by the scale of the problems they are faced with and by the fantastic work going on at Khelghar. I will leave you to read more about Khelghar Palakneeti, but let me tell you how inspiring women like Shubhada Joshi and her team of staff and volunteers are. Some have themselves grown up in the slums of Pune but have managed not only get a basic education but to go on to higher education. Not content with just improving their own lives and prospects, they work to support children and their families, helping them see that education is a way out of the trap of poverty. I felt very proud to be associated with these women and to play my own, very small, part in their project. So how was it, meeting the children? I must confess that I began to feel quite nervous. What were they expecting? Would I prove to be a disappointment, this so-called ‘granny’ from England? I learnt later from Suneeta that they were nervous too! Would they be able to understand me? Would they know what to say? But nerves were soon forgotten on both sides. I had decided to just carry on from the Skype session the week before, when we had been talking about the 2012 London Olympics. Within minutes we were on our hands and knees, sorting and matching pairs of cards. I followed this with a story they knew, Mr. Gumpy’s Outing by John Burningham but instead of just reading it, we acted it out. Their level of participation far outstripped what I had hoped for. I had a second session with the children a couple of days later, a practical activity, teaching them how to make felt. The plan was to make some bunting with the word Khelghar. So we set to with wool, water and soap to create and decorate our felt. Once again, the children threw themselves into the session and although we didn’t quite achieve the finished article at the time, they have shown it to me today, three weeks later, over Skype. Fantastic! This second session took place in the slum. Khelghar has two small buildings there where they hold classes for groups of girls and younger children. I thought that entering the slum might feel quite intimidating. The piles of rubbish being picked over by birds, cats and people, and the volley of barking from the thin, scabby looking dogs, is hardly welcoming. However, once again, I need not have worried. Whether it was the presence of the cameras, or the respect with which Suneeta Kulkarni and the staff and volunteers from Khelghar, are held within this community, I am not sure. We were greeted with friendly curiosity. People waved, called out greetings and warned us of holes, puddles and mopeds. It was wonderful to see how Suneeta was greeted by the children of the slums of Pune, one little girl rushing down the hill all smiles to throw her arms around Suneeta Tai. Children walked with us up the steep, treacherous lanes between the dwellings. Homes tend to be a single room, sometimes with a foundation of stone or brick, generally finished with wood or corrugated iron. They house the cooking equipment, sometimes the moped, a small shrine, some clothes storage and a large wooden family bed with a thin mattress. There is no running water inside, though an unreliable electricity supply is delivered across a tangle of wires. The people are construction workers, often the women too. The mother of one of my regulars, a woman of 36, is ill and waiting for her husband to be paid before she can collect her medicine. She has spent the last twenty years carrying bags of sand and cement on building sites. She would be beautiful if she were not so thin and drawn. She is determined that her son will finish his education and have opportunities that she and her husband have not had. In an interview with him earlier, he told us that he wants to be a car mechanic, which is certainly achievable. So what the BBC’s One Show viewers will make of my experience, I’m not too sure. I hope that the films will not only give a true idea of the vision of Professor Sugata Mitra but will do justice to the efforts of all those who make such a difference to the lives of children on a daily basis. As for me, well I count myself extremely lucky to have had this opportunity and hope very much that I can use it to further support the work of the project. And of course, I will always have a particular interest in the work of Khelghar Palakneeti and in the futures of the children I have met there. A group of kids is using a set of hanging scales to weigh various objects, while another group estimate each others’ weight and then stand on a scale to check. Sounds like it could be a standard lesson on measurement in any classroom, doesn’t it? The difference is I am at Khelghar, an after-school centre for slum kids in Pune, and these particular children would never be learning this way at the local school. They’d typically be sitting in rows facing the teacher and perhaps filling in answers to questions about measurement such as how many grams in a kilogram. She is an architect who worked as an interior designer till deciding that she didn’t want to work for rich people for the rest of her life, preferring to do something more meaningful. She’d been involved for some years in publishing a magazine about social parenting and decided to pursue this further by putting the ideas into practice in a way that could make some small difference. The initial project involved a program for local slum kids to experience learning through play. The only available place was Shubhada’s own home, so that’s where they went. As the numbers of children and volunteers increased, they spilled from the crowded living room onto the veranda, till it was time to seek funding and search for a more permanent venue. The current home of Khelghar is up 3 flights of stairs, in a building near to the slum in which the children live. The ratio of adults to kids is deliberately high, and there seem to be almost as many volunteer workers as children. Shubhada tells there are other visitors today, observing the way children learn through play, so that they can develop similar programs in other places. It’s encouraging to hear that the model is being used in other settings and there are apparently other Khelgars (it means Play House) springing up gradually across the state of Maharashtra. One of the best parts of this story is that of the group of young adults who attended Khelghar themselves who, in turn, provide similar opportunities for even less advantaged children, from an even poorer slum than theirs. 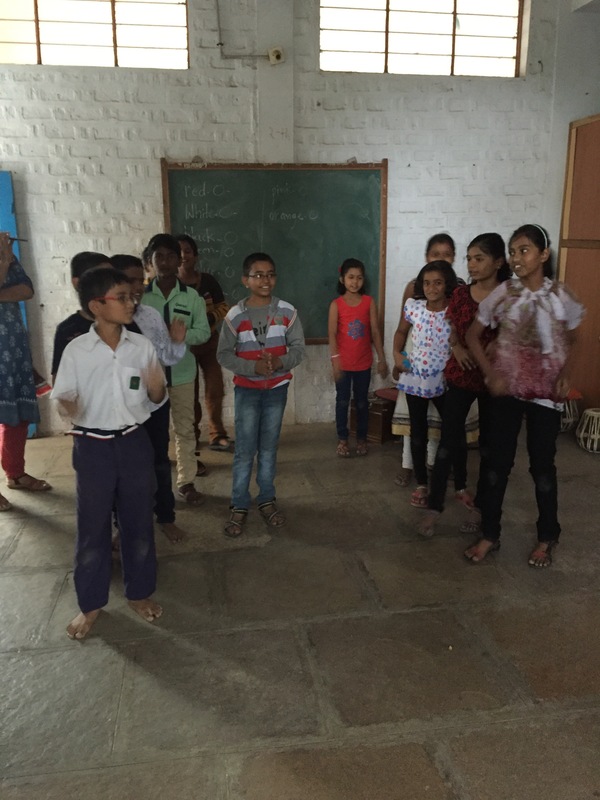 They regularly organize games and discussions for the kids, using the principles they learned from their own experiences at Khelghar. I’m inspired by Shubhada and others like her whom I met in Pune. There is no sitting back and saying ‘I can’t change the world so I’ll do nothing’. They simply decide not to be deterred by the overwhelming inequities and problems around them. They know they want to do something and they do. A small group of thoughtful people could change the world. Indeed, it’s the only thing that ever has. Margaret Mead. Almost as soon we meet, Suneeta tells me she has a surprise for me. I imagine a specially prepared dish or a small gift, perhaps a souvenir of India. It’s Sugata Mitra. He’s an old friend of hers, family almost, and she has worked closely with him for many years too. He’s in Pune for the day and visiting at her home. Sugata immediately puts me at ease with his friendliness and banter. His sense of humor is dry and he cheerfully pokes fun at all and sundry. He and Suneeta have been friends since childhood and during my stay, she shares anecdotes from their past. I don’t generally think about the private lives of people whose work inspires me, so this is fun! Ever since first encountering the the hole-in-the-wall, I have been fascinated and excited by the project, the further developments and related research into self organised learning environments. In a series of real-life experiments from Delhi to South Africa to Italy, he gave kids access to computers and the internet, producing results that should revolutionize how we think about teaching. It helped me see that if teachers let go of control and allow students to direct their learning, the learning is much more engaging and meaningful. We talk about hole-in-the-wall and I learn that it is a company now, with computers in holes in many places. We talk about SOLES and Sugata tells me more about his work in schools around the world with self-organized learning environments. I tell him about my school and we share anecdotes about teachers who have trouble letting go of control and allowing the students to own their learning. I’m interested to hear that he has seen new open-plan learning spaces being used in old ways and I realise that the reality at my school’s junior campus is far from unique. He confirms that changing practice takes time and is dependent on what people believe about learning, something we often talk about within my PLN. He tells me about his coming extended research, through MIT University in Boston, into how children teach themselves to read. Here’s a link to one of his recent talks on student directed learning. Over lunch of dahl and rice, spicy fish and chappati, the conversation is relaxed and easy. Although today is the first time we have met, I’m with people who not only share my interests, but have helped shaped my beliefs about learning. I’m in my element. Every time I step out of the door in Pune, it’s a learning experience! I’ve been here four days and it feels like four weeks because of the variety and intensity of experiences. The highlight has been finally meeting Suneeta, who I first connected with online through the SOLE project. She has shown me so many sides of Pune. She has introduced me to all sorts of interesting people, some of whose stories I will share in future posts. I’ve seen an experimental play at Pune University as well as music and dance performances at Symbiosis College. At the other extreme, I have visited a SOLE at Yeoli village and met the group at Khelgar, where kids from a local slum gather after school to learn through play. I’ve ventured out into the city, both on foot and by auto-rickshaw, usually with Suneeta’s son Anand as my cheerful guide, sharing his colourful stories and helping me cross the roads. He needs constant reminders to slow down so that I can absorb everything around me… unfamiliar and now-familiar sights, smells and sounds. Best of all, Suneeta and I have had endless conversations about education, culture, language and religion, about disability, poverty, inequity and making a difference, about theatre, books, food and saris… conversations about life.